Efren Gonzalez is a resident of his beloved hometown Ajijic, Mexico. 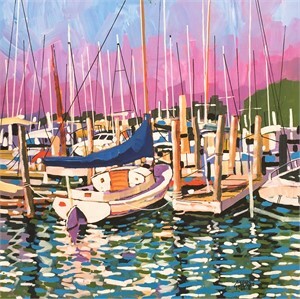 A prodigious painter in all mediums: watercolor, pastel, and acrylic, but oil is his preferred medium. He is also a muralist, having completed his first intricate mural in the 90’s and since then many more in Ajijic. 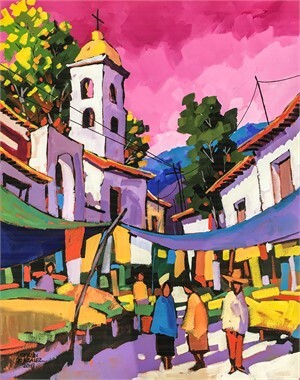 His paintings depict the things he sees in everyday life – the colorful people and the landscapes of Mexico. 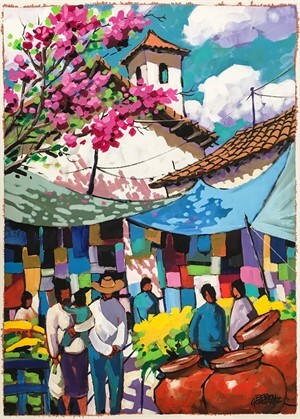 His Ajijic paintings have a great sense of pattern and use of vibrant colors that can been seen through the market place and city scenes of Mexico. 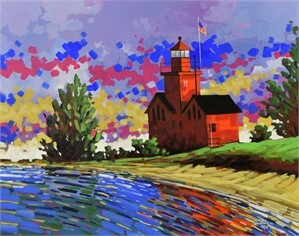 His brush strokes are expressive and often geometric. His watercolor and landscape oil color paintings are tighter and more controlled with the subtle and subdued tones of dusk. Efren’s journey to become a working artist began early. As a child, he won local and regional drawing competitions. After high school, Efren started studying Architecture and then Plastic Arts, but soon found out that he didn’t have the patience for either. To make his daily bread he worked in restaurants, factories, and as a translator. Yet all the while he continued to draw and paint. While still searching for a career and vocation, Efren was offered a grant to study art at a small college in Maryland. It was there that he continued to develop his skill and was enriched by seeing in person the great works that he had only admired in books. A year later he returned to Ajijic and took up his brush. Efren was inspired and taught by the famous local Neil James Art Education Program. He studied with Antonia Cardenas, international painter B.R. Kline, watercolorist Luis Eduardo Gonzalez, sculptor Kent Clark and etchist Juan Navarro. Efren is now featured in wonderful galleries across North America and attends and teaches classes. 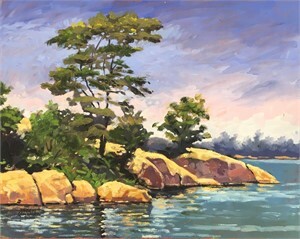 His most recent class was an oil painting course taught in our neighboring town Holland, Michigan! J. Petter Galleries met him through this class and fell in love with his lively images and kind and caring personality. Efren Gonzalez is a resident of his beloved hometown Ajijic, Mexico. A prodigious painter in all mediums: watercolor, pastel, and acrylic, but oil is his preferred medium. He is also a muralist, having completed his first intricate mural in the 90’s and since then many more in Ajijic. His paintings depict the things he sees in everyday life – the colorful people and the landscapes of Mexico. 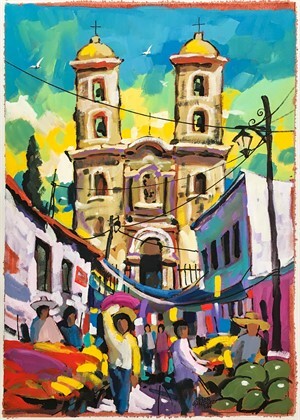 His Ajijic paintings have a great sense of pattern and use of vibrant colors that can been seen through the market place and city scenes of Mexico. His brush strokes are expressive and often geometric. His watercolor and landscape oil color paintings are tighter and more controlled with the subtle and subdued tones of dusk. “Art started with a pencil,” Efren says, “almost as soon as I could hold it.” Efren’s journey to become a working artist began early. As a child, he won local and regional drawing competitions. After high school, Efren started studying Architecture and then Plastic Arts, but soon found out that he didn’t have the patience for either. To make his daily bread he worked in restaurants, factories, and as a translator. Yet all the while he continued to draw and paint. While still searching for a career and vocation, Efren was offered a grant to study art at a small college in Maryland. It was there that he continued to develop his skill and was enriched by seeing in person the great works that he had only admired in books. A year later he returned to Ajijic and took up his brush. Efren was inspired and taught by the famous local Neil James Art Education Program. He studied with Antonia Cardenas, international painter B.R. Kline, watercolorist Luis Eduardo Gonzalez, sculptor Kent Clark and etchist Juan Navarro. Efren is now featured in wonderful galleries across North America and attends and teaches classes. 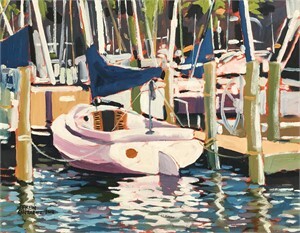 His most recent class was an oil painting course taught in our neighboring town Holland, Michigan! J. Petter Galleries met him through this class and fell in love with his lively images and kind and caring personality.